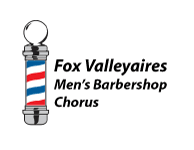 Fox Valleyaires - 2018-09-16 - Chorus news item: Join us for our Christmas Chorus! Join us for our Christmas Chorus! You are invited to sing with us at our 2018 Christmas concerts! It's fun, free, and there is no obligation. Christmas Chorus participants will join us for five Tuesday night rehearsals from 7-8 PM begining on November 6 at First English Lutheran Church North, 6331 N. Ballard Road in Appleton. (If you need to miss one of those rehearsals, you can still participate.) You will then join us for several songs in our Christmas shows on December 5 and December 11. No barbershop experience is necessary. If you are a man who enjoys singing, we'd love for you to join us! For more information, call Scott Finley at 920-475-4348 or Jan Berg at 920-739-6881. Or just show up at 7 on Tuesday!